Molagootal is a very comforting dish for me. 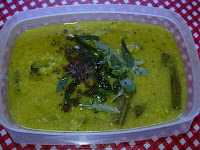 Molagootal rice with paruppu thogayal is my mom's favorite. After her death, I stopped eating this molagootal and thogayal. Today, after a very long time, I made this thogayal along with drumstick molagootal. Pressure cook moong dhall and toor dhall adding a pinch of turmeric powder and keep it aside. 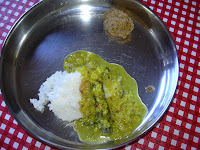 In the mean time, grind coconut, green chillies, rice and cumin seeds into a fine paste. Keep it aside. Take a pan, add drumstick, add required amount of water, turmeric powder and salt and let the drumstick cook. When it is 3/4th cooked, add the grounded paste, a little water and let it cook for another 3 mts. Now add the cooked dhall to it and let it cook for another 5 mts. Add water to adjust the consistency. 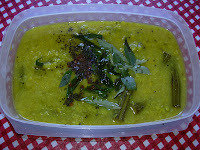 Take a small pan, pre heat oil, splutter mustard seeds, fry urad dhall, asafoetida powder and curry leaves to golden brown and pour it on top of molagootal. This is a new one for me. With dhal and drumsticks, it sure will be healthy.